While traveling through Spain, my sister and I were overjoyed to Google a kosher restaurant on La Rambla, a popular tourist thoroughfare in Barcelona. After a week of canned tuna and KIND bars with a sprinkling of vegan meals here and there, if we were lucky, we couldn’t be more excited for a kosher hamburger! 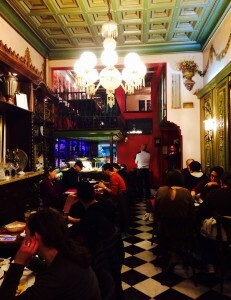 We expected to find a hole in the wall take out style restaurant but instead found ourselves in an ornate classic sit down restaurant with waiter service at Maccabi Restaurant. Maccabi’s menu is a mix of Israeli grill (such as chicken shish kebab and hummus) as well as traditional Spanish classics such as patatas brava, chicken or fish paella, and some other fried fish tapas. A small section of Kosher red and white wine is also on the menu. Overall the food was pretty good and not too pricey. The atmosphere and service were wonderful! I have eaten there twice and will probably go once more before leaving Barcelona. So glad to have access to a full service kosher restaurant which is otherwise hard to find in Barcelona. 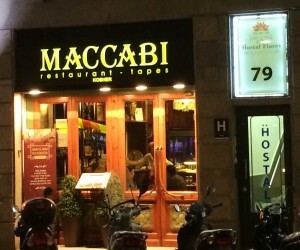 Maccabi Restaurant opened in October 2013 and is Glatt Mehadrin under the supervision of the Rabbinate Chabad Lubavitch Barcelona.